Jack was a native of the farm from Chapman, Alabama. He was a self-taught musician as he came from a family of non-musicians. From there he went to Mobile where he sold newspapers and then took advantage of every chance he could to perform professionally. Before Jack finished school at the Barton Academy in Mobile, he took a job as an electrician's helper, wanting to earn some money. He became rather proficient at it and would sail out of the Port of Mobile as chief electrician on many ships, but a back injury forced him into work that was less strenuous. Because of that, he began to turn to music as a career. During World War II, he served with the Navy. Around 1953 or so, he was being heard on a radio show called the "Tom 'n' Jack Show" on WKAB out of Mobile, Alabama. Back then, he was recording on the King record label. 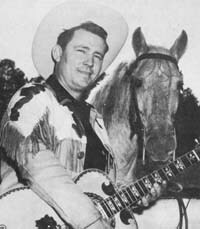 One of Jack Cardwell's first releases on the King label was a tribute to Hank Williams that reportedly sold over a half a million records! Jack met his wife while he and his band were playing a dance date in Mobile. And had a couple of boys, Jackie Carrol and James Robert. Jackie played the piano back then and James wanted to be a singer 'just like dad'. Interestingly, in about the only time we've ever seen it, the February 1955 Cowboy Songs article actually listed the street address where Jack lived in his 8-room house. And more so, they said the house was completely furnished by a furniture store that had been his sponsor on the radio for seven years. Jack originated a bit of a tradition in Mobile with the "Hillbilly Christmas Party". It was a benefit for the poor children of Mobile at christmas time. Jack would get together some of the biggest names in country music and they would put on a show at the Ladd Stadium. The artists would contribute not only their talents, but also paid their own transportation and expenses. Admission was simple: just bring a toy. Even the artists had to pay 'admission'. The show was held about two weeks before the Christmas holiday so that the 'forgotten' children of Mobile would have something for the holidays. Along about 1955, Jack had a show called "Mr. Friendly" that was on WALA-TV every Thursday evening at 6:00pm.